Name-dropper: the students' association at Adam Smith College has opted to name itself after socialist Jennie Lee (left) instead of economist Adam Smith. HE IS regarded by many as the greatest economist of all time, the man who invented capitalism and paved the way for the greatest period of wealth the world has ever known. But try telling that to the firebrand students at Adam Smith College, the Fife educational institution recently renamed in his honour. In an episode some would say is reminiscent of loony-leftism at its glorious worst, the college's students' association has decided Smith represents what they regard as the world's greatest evils - namely, exploitation, greed, Thatcherism and Reaganite economics. Consequently, students at the Kirkcaldy college have refused to name their association after Smith and plumped instead for the more "right-on" Jennie Lee, the Lochgelly-born socialist, first female Labour MP and wife of Nye Bevan. The newly named Jennie Lee College Students' Association is even refusing to use Smith's name anywhere in its correspondence. The row is somewhat embarrassing for local MP Gordon Brown. Last week he was made chancellor of the college which he had invited the most powerful man in the world economy to visit. Alan Greenspan, chairman of the US Federal Reserve Board, delivered last year's annual Adam Smith lecture at the college. Brown hails Smith as one of his heroes. A spokesman for Brown, whose constituency is Kirkcaldy and Cowdenbeath, said: "It's really up the students' union what they call themselves." But last night, the London-based Adam Smith Institute criticised what it called a "childish" return to the 1980s, when many student unions and Labour councils changed the names of buildings and streets to honour left-wing icons. The controversy began when it was decided to merge the former Kirkcaldy and Glenrothes colleges and name the new institution after Smith. Paul Muirhead, a member of the students' association, said the decision to reject Smith was backed unanimously at a meeting of 30 members. He said: "Last year, when the name of the college was decided, it appeared to come out of nowhere. We didn't feel that Adam Smith represented the values a students' association should stand for. "He is associated with socioeconomic policies that work against the people, that were synonymous with Thatcherite and Reaganite governments. "Jennie Lee would be an excellent role model for the students because of the courage and conviction she showed in achieving the aims she believed passionately in." He added: "This isn't an attack upon Adam Smith as a person, but upon what his name has come to represent. Adam Smith's name is linked to exploitation and greed." Although the college's board of governors may still veto the association's name, they are unlikely to overrule the students. 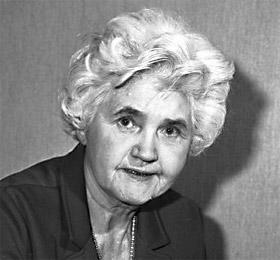 Jennie Lee is a well-known local figure as well as a founder of the Open University. A spokesman for the college said: "They are free to call themselves a name of their own choosing. Our new college is all about people and so it is fitting that they have named themselves after a local person who has done a great deal of good." But Eamonn Butler, the director of the Adam Smith Institute, said: "On one level it's up to them what name they adopt but it is rather childish and it is based on a complete misunderstanding of what Adam Smith actually believed in. It's actually very hard to pigeonhole him as being right wing. "His work on the theory of moral sentiment is all about sympathy for people, which isn't really about being left or right wing at all. He believed in free markets because he thought that was the best way to make the poor better off. He is one of the giants of the Scottish Enlightenment and should be remembered." Born in Lochgelly in 1904, miner's daughter Jennie Lee was interested in politics from an early age. She studied education and law at Edinburgh University, and regularly made socialist speeches on The Mound and in Princes Street. She was elected Labour MP for North Lanark in 1929. At 24, she was the youngest member of parliament at that time. Adam Smith was born in Kirkcaldy in 1723. Sent to Oxford on scholarship at the age of 17, he learned Greek and read the works of David Hume. In 1751, aged 28, he became a professor of logic at Glasgow before taking the chair of moral philosophy the following year. In his seminal work, The Wealth of Nations, he studied the "invisible hand of the market" and his book later became the foundation for free-market economics. COULD it be the first sign of a return to the spirit of 1968, when radical students took to the barricades? The red flag is fluttering proudly over - of all unlikely venues - the Adam Smith College in Fife, where the Students' Association has rejected the name of its entrepreneurial patron and opted instead to commemorate Jennie Lee, spouse of Aneurin Bevan. What makes their cause even more célèbre is the fact that Gordon Brown is chancellor of the college, as well as of the Exchequer. He appears to be relaxed about whatever patron the students adopt - except, presumably, Tony Blair. But are the students being adventurous enough? Jennie Lee, after all, ended up as a baroness - a sinister parallel with Margaret Thatcher. Would the Che Guevara Association not have a better ring to it? Or the Lenin Institute, or the Mao Tse-Tung/Tiananmen Square Memorial Hall? Nearer home we have such names as Arthur Scargill and Michael Foot, prophets of a more credible economic system than a dreamer like Adam Smith - names for the many, not the few.